Posted on 5, September 2016 by EuropaWire PR Editors | This entry was posted in Aviation & Aerospace, France, Marketing, Russia, Transportation & Logistics, Travel and tagged ACJ319, Airbus corporate jets, Jet Expo show in Moscow. Bookmark the permalink. “Cabins are very important in the business jet world, and the comfort, space and freedom that you get in an Airbus corporate jet has to be experienced to be truly appreciated,” points out Airbus Chief Operating Officer, Customers John Leahy. 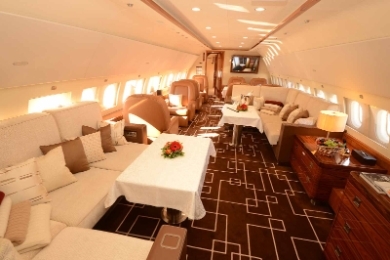 TOULOUSE, 05-Sep-2016 — /EuropaWire/ — Airbus Corporate Jets is exhibiting an ACJ319, operated by MJet on VVIP charters, at the Jet Expo1 show in Moscow. Part of the ACJ320 Family, which has the widest and tallest cabin of any business jet, the ACJ319 is in widespread service worldwide with companies, individuals and governments. “Cabins are very important in the business jet world, and the comfort, space and freedom that you get in an Airbus corporate jet has to be experienced to be truly appreciated,” points out Airbus Chief Operating Officer, Customers John Leahy. “Flying in an Airbus corporate jet really is a much better experience, as more and more of our customers are finding out,” he adds. Airbus corporate jets are derived from the world’s most modern aircraft family, which means that they bring an impressive heritage of efficiency and reliability to the business jet world. They also deliver the features that business aviation now expects as standard in new aircraft, such as integrity-enhancing fly-by-wire controls, cost-saving centralised maintenance and weight-saving carbonfibre. A culture of innovation keeps the Airbus family modern, with major improvements such as fuel-saving Sharklets and new-generation engines giving it the advantage in both the airliner and corporate jet worlds. These give the ACJ320neo2 the ability to carry 25 passengers 6,000 nm/11,400 km and the ACJ319neo the power to fly 8 passengers 6,750 nm/12,500 km. For customers that want even more capacity and range, Airbus offers VIP versions of its widebody family. This includes the world’s newest airliner, the A350, which features a weight and maintenance-saving carbonfibre fuselage and wings. Airbus corporate jet customers and operators benefit from services tailored to their specific needs, as well a worldwide support network of technical advice, training centres and spares stocks that supports more than 500 customers and operators around the world. More than 180 Airbus corporate jets are in service, flying on every continent, including Antarctica. Airbus Corporate Jets (ACJ) create the world’s most rewarding flying experiences with customers by providing them with unique expertise, the finest service, best technology and highest standards of care in corporate aviation. supported around the world, around the clock. The ACJ family gives customers the greatest choice of wide and spacious cabins, presenting inspiring and infinite possibilities in creating unique spaces that offer the best comfort and functions. Those customers who want even greater space to carry even more passengers can opt for one of ACJ’s full family of VIP widebodies that also deliver “non-stop to the world” range.